Let's Check Out North Korea's Brand New Website! Hey, internet people! 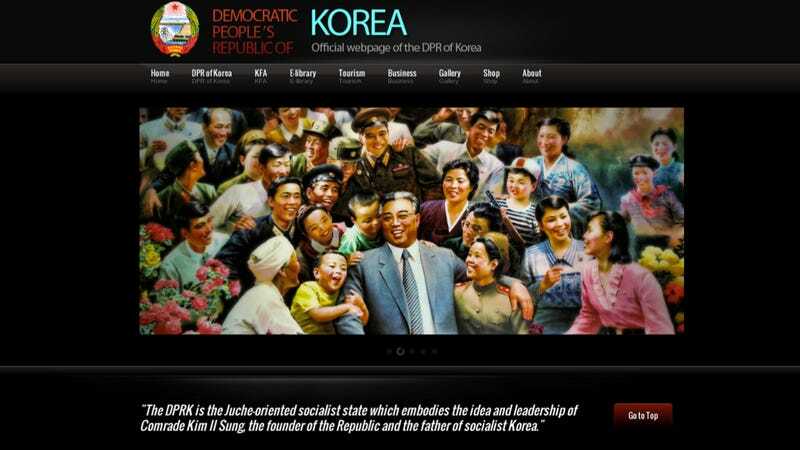 Did you know that the Democratic People's Republic of Korea (aka North Korea) has a brand new website. It's pretty slick, based on a $15 design, and it replaces North Korea's previous site, which can be best summed up in one word: medieval. But I guess the same thing can be said about North Korea. Opening up the website, you are greeting with a simple and straightforward design. It's clean and not cluttered. You can't help but wonder if the Great Successor—a video game and anime nerd—put revamping North Korea's online presence as one of his first priorities. Man, I sure hope he did. I also hope feeding his people was second, but let's not get ahead of ourselves. The landing page flashes images of things like singing children and military marching bands. Consider those boxes checked. The rest of the website is a rabbit hole of North Korean propaganda and info. There is also a gallery of photos. I couldn't get the thumbs to open, though. Go figure! There's also a gift shop that sells an array of, well, North Korean propaganda. The site also offers you, yes you!, the chance to become a KFA (Korean Friendship Association) Member. From the site: "Any person in the world interested in the DPRK and regardless of race, nationality, politics or religion who shares the common goals of the KFA." Fair enough. KFA members get to travel to North Korea (check out this ChinaNet story or Vice's Guide, in case you missed it). Membership is free and all you need to do is email "your complete name, address, telephone, birth date and e-mail". I'd imagine that they'd get your email if, you know, you sent them an email. But sending North Korea my phone number and home address? And if you'd like to become a card-carrying KFA member, you need to send €50 and a scan of your passport. How about you let us friend you on Facebook first, North Korea? We'll take it from there.